Spiders are arachnids, not insects. Depending on the type of spider, there are many techniques and commercial sprays to rid your house of spiders. Contrary to popular belief, spiders do not often bite people. Killing an infestation of spiders can be difficult since spiders to not have a circulatory system to carry the insecticide to the spider’s organs. Treatment of an infestation of spiders has to be direct. 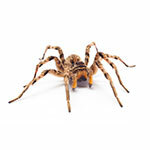 Pest-Pro Specialists can come periodically to monitor your home and help prevent an infestation ofSPIDERS.